Richard suddenly learns that his mother is dying from leukemia. Leaving his mistress, he becomes desperately attached to his mother. He realizes, too late, how much they love each other. June 1944. Farmer's seventeen-year-old son Lucien Lacombe cleans a hospice for a living. The epitome of his father, war prisoner, motivates him to get involved in a parallel army. He is refused by the leader of this army. He finishes being enrolled into German police. He falls in love with France Horn, a Jewish tailor's daughter, hidden in the county. As he is leaving prison Serge is captured by hoods, who want to know where his loot is hidden. 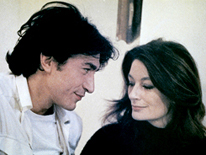 His pal Michel saves him from their clutches, and Serge can go back to his lovely wife. The three escape and go to get the jewels, but their plan backfires, they are arrested again. However the police inspector has something else in mind and does not take them back to jail. 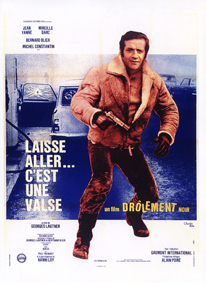 A thrilling gangster film spoof tinged with grim humor. A South American head of state mysteriously vanishes during a dinner at the Grand Restaurant. The owner of the restaurant, Mister Septime, is a prime suspect. An organization of treacherous terrorists, hot on the trail of the missing politician, takes over the restaurant where a fabulous game of hide-and-seek pits the police against reporters and Septime's staff. 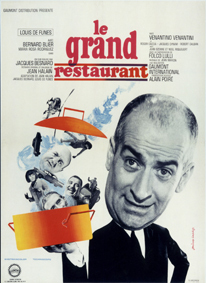 A comedy fringing on the burlesque with Louis de Funès.